NEW YORK -- The variety of reactions from the New York Knicks' entertaining 102-92 victory over the Miami Heat Thursday night were certainly illuminating. "It was a big game for us," said Amar'e Stoudemire. "It is a confidence booster," said Carmelo Anthony. "I only missed six [free throws]; I didn't miss 20. It wasn't that damn bad," said Dwyane Wade. "Everyone CHILL it's Jan. 9," tweeted Heat owner Micky Arison. "My feelings obviously don't matter," said J.R. Smith. Just a standard Heat-Knicks regular-season game, which have been like a portal to an alternate universe over the last two years. It's in these contests where the Knicks look like title contenders, the Heat's emotional investment appears a little questionable, and if there is any drama, it is usually in the winning locker room. 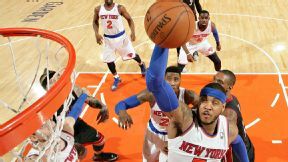 Nathaniel S. Butler/NBAE/Getty Images Carmelo Anthony had 29 points and eight boards in the Knicks' win. The Knicks are now 4-1 against the Heat in the regular season the past two years and now 4-1 in their last five games in 2014. This performance on its own was simply fantastic, probably the best all-around game the Knicks have played this season when you factor in the teamwork they displayed at both ends and the quality of the opponent. Though it was hard to miss the Heat's quasi-interest, which has been a common trait over these past two seasons in these games. It manifested itself in the focus areas like free throws -- they miraculously shot worse from the line (52 percent) than they did from the field (54 percent) -- and turnovers. LeBron James had a strong 32 points but had six turnovers, running his tally to 25 over the last six games. There were times when the Heat were caught trying to rebound without jumping and just stopped playing defense midway through possessions. In the postseason over the last few years, it can seem like it takes five or six crisp passes with orchestration to get a quality shot against the Heat. And plenty of times the Heat get their hands on the ball or break the opposition's flow long before it reaches that tally. The strategy is usually the same in the regular season, except sometimes it only takes three passes to get it done against them. It's a natural byproduct of their reality, which might be a belief they're usually so much better than the opposition that they can get away with lesser effort than their strategy is designed for. "We know who we are and they know who we are and the league knows who we are," Heat coach Erik Spoelstra said. "We have to stay committed to that and that takes a great deal of energy." The Knicks seemed to sense a little energy drain and responded by increasing their own, especially when it came to some excellent ball movement. This seems rather elementary, but the Knicks are a totally different team when they get real genuine production from their ball handlers in the backcourt. For so much of this season, the Knicks' point guards have been hurt or ineffective. And their shooting guards have been dreadful -- career-worst dreadful. So when Raymond Felton has a night when he attacks on pick-and-rolls looking to score aggressively or whips the ball with purpose and racks up 14 assists, it can make quite the difference. Especially when the Heat are less than fully engaged. When that sort of leadership by the point guard is backed by Iman Shumpert making some shots, as he has being doing during this five-game stretch, the Knicks look like a really good team again. Anthony had 29 points, which was fine, but he's had a lot of nights like that in Knicks' losses and it sure looks better when it's part of a team effort. They did it on a night when Tyson Chandler was home sick and Smith was benched in what looked like an unofficial suspension by coach Mike Woodson for the culmination of Smith's series of antics and misjudgments. Keeping a 35 percent shooter off the floor can improve a team's offensive output, it must be said. Looking at Smith's recent stretch of decisions, he probably was surprised that untying a player's shoes would be considered the final straw. Though Smith's explanation of how he reacted to the league's warning to stop unsportsmanlike conduct before they fined him $50,000 for mocking the edict sort of says it all. "It wasn't one of those [warnings] where you're like 'oh damn'," Smith said. "It was one of those warnings where you really don't know the outcome of it." Give Smith this, he's been warned so often in his career that he believes he can identify nuances in them. Meanwhile, over the in the Heat locker room, they were taking the owner's advice and chilling. "I was 11-of-15 from the field and everyone wants to talk about my missed free throws," said Wade, who was 0-of-6 from the line and saw his season average from the foul line dip to below 70 percent. "I missed six free throws and I got seven questions about it." So just another regular season Heat-Knicks game. MVP: Carmelo Anthony shook off some early rust and quietly put together perhaps his best all-around performance of the season: 29 points (12-of-24 shooting), eight rebounds and five assists -- a small victory in the LeBron-Melo rivalry, but a victory nonetheless. X factor: Free throws. Both teams were terrible, but the Heat (11-for-21) time and again shot themselves in the foot. Dwyane Wade -- who shot 11-for-15 from the field -- was especially atrocious, missing on all six of his charity-stripe attempts. Turning point: With Melo struggling and the Heat threatening to blow the doors off early in the third, Iman Shumpert canned a trio of 3-pointers in a three-minute span to keep the Knicks in it and put the Garden crowd to its feet. The Knicks never looked back. MVP: Ty Lawson has been on a tear of late, and continued that hot streak tonight. His 16 points came in every which way -- bursting into the lane, pulling up from deep, you name it. He also notched 14 assists, getting his shooters and bigs involved. LVP: OKC's bench. Balance is a rare find for any team in the NBA -- relying on starters to play 48 minutes just isn't realistic. A good bench is thus essential to a team's success. Normally, the Thunder's bench is among the best offensively in the league. Tonight, however, most of their points came in garbage time. X factor: Randy Foye. Shooting slump? What shooting slump? Foye sank 6 of 9 from beyond the arc tonight on his way to 24 points. Ty Lawson, Nuggets: Lawson nearly poured in a triple-double (16 points, 14 assists, 7 rebounds) as the engine of Denver's impressive win over Oklahoma City. Lawson is averaging nearly 13 assists during the Nuggets' four-game win streak. Chris Bosh, Heat: Bosh managed only six points on 3 of 10 shooting in Miami's loss at the Garden. He pulled down nine rebounds, but couldn't slow the Knicks' duo of Andrea Bargnani and Amar'e Stoudemire, which combined for 33 points and 16 boards. "I only missed six. I didn't miss 20. It wasn't that damn bad." -- Heat guard Dwyane Wade, on going 0-for-6 from the free throw line in Miami's loss to New York. 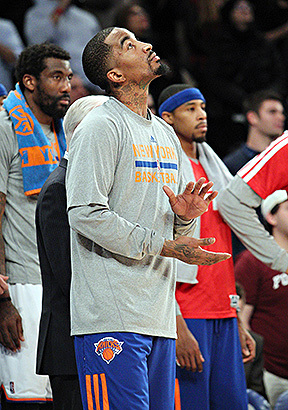 Brad Penner/USA TODAY Sports After landing a $50,000 fine, J.R. Smith landed on Mike Woodson's bench on Thursday night. The New York Knicks continue to have the Miami Heat's number, beating them 102-92 Thursday for their fourth win against the two-time defending NBA champs in five meetings since the start of last season. The Heat's 1-4 record against the Knicks over that span is their worst against any opponent.